Before wading chest-deep back into Step 4, we ruminate about what our new campaign says about our mechanics, and we introduce static attribute defenses. Join us as we tackle Citadel, Champion, Scoundrel, Zealotry, and Radiance! Riding the high of our upcoming Actual Play campaign, we talk about potential balance issues and settle on terminology for our Dice Tier system before diving feet-first into Step 4: creating new abilities for Decay, Command, Champion, Fire and Ice. Listen in and get ready to spend some Momentum! Following the Grand Finale of our first actual play campaign, we further mill around the subject of damage scaling and debate the rules and terminology of an entirely new school of magic! Listen in and get pumped with us for the next phase of your favorite podcast! We explore some mild party drama and talk about how to resolve it, but the real meat of this episode is where we dive off the cliff into the dangerous waters of damage scaling. Our proposed solution is guaranteed to be controversial, but if geeks like us enjoy anything… it’s arguing. We delve into our hopes and dreams when preparing to sit down with a new gaming group. Also, what is magic? Is it the power that underlies all reality, like The Force? Is it an alien essence being unknowingly mined by the collective unconscious for the benefit of our devourers? Is it like trying to tell a stranger about rock and roll? We don’t know! Let’s just make something up. We commit the ultimate party faux pas and delve deep into the cultural and political strife of our world, coming up with 3 distinct religions and give names to those who would be Emperors. Want to go Core Radiance but feel underwhelmed at unfairly targeted by Martyr? You’re in luck! In this episode, along with rounding out some corners, we discuss some pie-in-the-sky Path ideas to see if anything from them is worth stealing for our current ones. We also finally begin our difficult conversation about Magick as a system. We come up with a new game name, patch up some small holes, do away with ammunition tracking, add a HoT spell, and dig deep into the meat of what conditions you gain when you fall to 0 HP, making our game riskier than ever for PCs. Listen in, and crawl your way out of a dungeon together with your Homebrew Hombres! We ratchet up the difficulty by deciding what happens when the players fail to get a full night’s rest and further complicate what happens to characters when they fall to 0 HP. We also come up with an elegant way of creating and using potions. Along with ironing out a half-dozen other small details, we bring up the feedback from one of our Patrons and work it into our game. Pitch-in and listen-in! 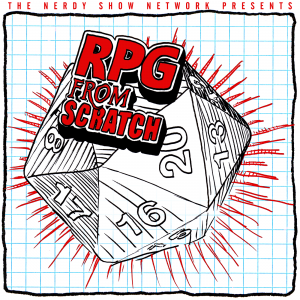 RPG From Scratch :: Design Episode 10 :: Break a Leg! We recently took Scratch Dice to AVL Scarefest in North Carolina and in this episode we recap our experience running our game for strangers and share some of the excellent feedback we received. We completely revamp how we handle Death and Dying as well as throw in some lingering effects for those who touch the void. How many broken legs do you want? We have them on special! Dungeons & Doritos :: The Debut Episode REMASTERED!